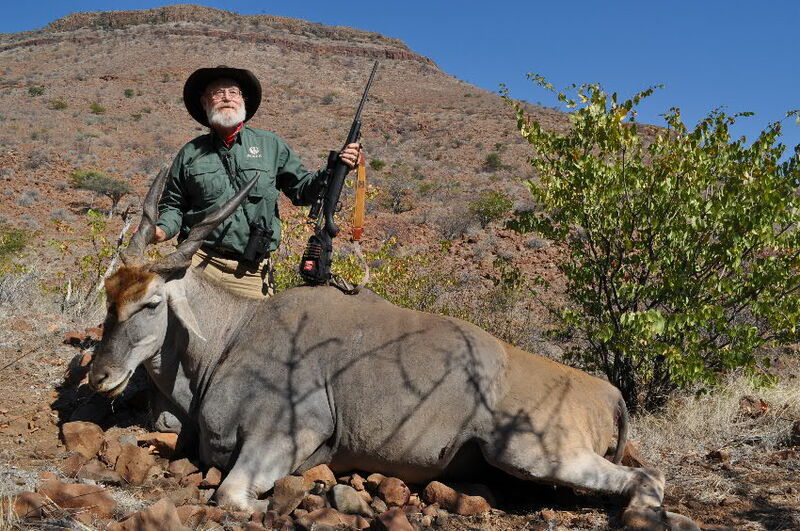 Larry Weishuhn with a trophy eland from his most recent hunt in Namibia. It is nice when a long-time friend endorses an author’s book. It is even better when he tells you that he really enjoyed it, as Larry Weishuhn did on my Sept. 17 radio show on WebTalkRadio.net. On this episode of Hovey’s Outdoor Adventures we talked about his recent successful hunt in Namibia and what could perhaps be best characterized as an interesting camping experience in Central Asia. Weishuhn and I had our first interchanges when he was representing Thompson/Center Arms and I was covering muzzleloading guns as a Corresponding Editor for Gun Digest. As a pioneer in the field and maker of a variety of muzzleloading guns (since reduced in numbers of models and types), I enjoyed working with T/C’s guns, and particularly with the 209X.50 Encore muzzleloading pistol. This gun took a 350-pound hog on a hunt with T/C’s Ken French and Gregg Ritz on the Nail Ranch in Texas, later the gun went to Africa where I shot warthog and impala with it. This is, and remains, one of the best muzzleloading handguns ever designed. Of all the derivations of the Encore including muzzleloading and cartridge rifles, pistols and shotguns, I liked this pistol best of all. People who use muzzleoading pistols for hunting are relatively few, and the muzzleloading version of the pistol was dropped a few years after it was introduced. 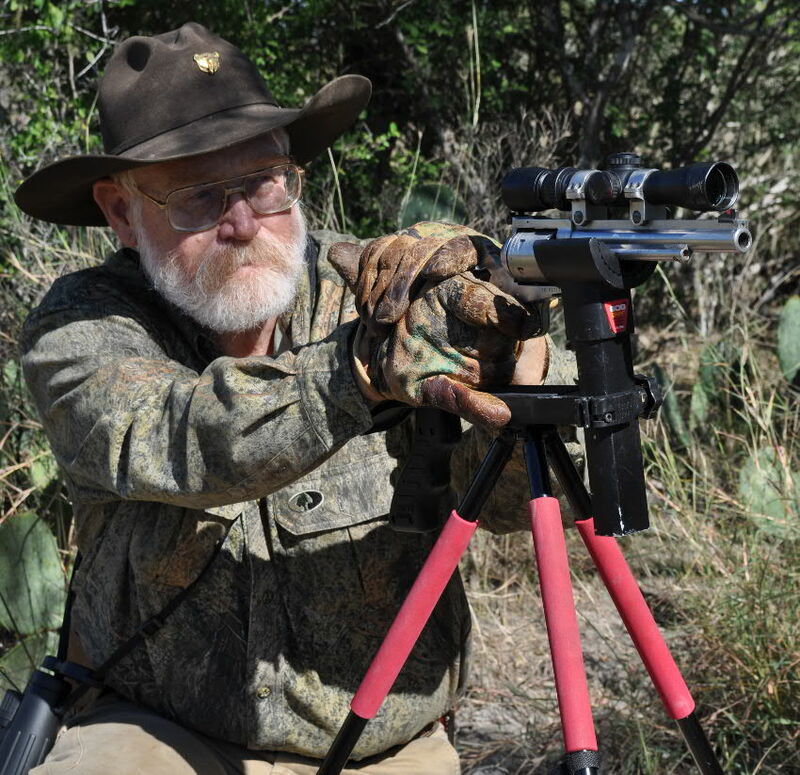 Weishuhn has always enjoyed handgun hunting and has written extensively on the topic. He, like I, grew up reading Elmer Keith. While Weishuhn progressed to the larger calibers of T/C’s long-barreled rifle-caliber single-shot handguns and hunted with them all over the U.S., I enjoyed exploring the potential of hunting muzzleloading handguns made in a variety of styles and ignition systems. Now Weishuhn reps for Ruger and in the photo he is shows with a hunter model of Ruger’s Super Blackhawk revolver. On the recent hunts the revolvers were left in the states, and he hunted with Ruger’s new American Rifle, which is a precision made, affordable rifle. The gun that he took was chambered for the .30’06 and he used a 165-gr. Horniday solid copper bullet. This caliber and bullet is generally considered too small for tough African plains game, but with precise shooting the solid copper bullets worked well and made decisive kills. For more details and pictures of his hunts, visit my Hovey’s Outdoor Adventures Show Blog at www.hoveysoutdooradventures.com and listen to the hour-long all-Weishuhn show by using the live link to the WebTalkRadio.net show page. Last year we did an episode of Hovey’s Outdoor Adventures on handgun hunting. We talked about our experiences taking both large and small game with these short-barreled guns. This show is still available as an archived show on WebTalkRadio.net and on Apple’s iTunes. This year I had a chance to catch up with this always-busy outdoor writer, arrange for a follow-up radio show and send him my book to read between trips. Weishuhn also writes books, and among his recent books are Under the Hunter’s Moon and, coauthored with Wayne Fears, Whitetail Deer : East and West. Besides appreciating the detailed load and hunt information that I gave for a variety of muzzleloading rifles, smoothbores and pistols; he said that among the things that he most appreciated was a chapter that I did on Knight Rifles. In this chapter I explained how Tony Knight, then an out-of-work railroad machinist, came to start his own gun-making company and revolutionized muzzleloading hunting. He and Jim Zumbro had often hunted with Tony Knight and he enjoyed not only vacariously reliving these experiences but also my explanation of the “how and why” the company evolved. (The company was sold, went bankrupt, was repurchased and is again making guns in Athens, Tennessee). 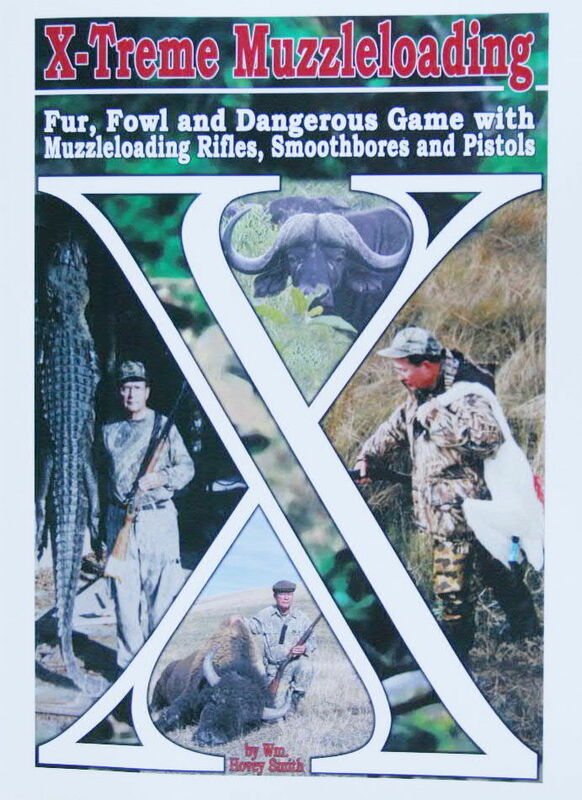 X-Treme Muzzleloading: Fur, Fowl and Dangerous Game with Muzzleloading Rifles, Smoothbores and Pistols is available from my website, www.hoveysmith.com, from Amazon.com, all electronic booksellers or may be ordered from your local bookstore or directly from www.authorhouse.com. This original Rigby blunderbuss is from the 1790s and is a flintlock. Most blunderbusses were originally flintlocks; although some were altered to the percussion ignition system. The blunderbuss was an interesting and useful self-defense gun whose development peaked in the late 1700s. The distinctive belled muzzle helped to speed loading, but did little or nothing to scatter the shot. Mostly, these guns were made as short-barreled flintlocks that could be easily handled by sailors in close combat on crowded ship decks or by coachmen. Often pistols and blunderbusses used in naval warfare were not equipped with ramrods. During a fight on a crowded ship’s deck there was no time to reload. Everyone carried with a pike, sword, ax or spear, and there was nowhere to safely reload a gun on a ship’s deck. Marines, used as snipers in the rigging, could reload, but the sailors fighting on the deck below could not. After being fired, sailors often dropped their guns and grabbed a cutlass. There was more of a possibility that multiple shots might be fired by coachmen, and their guns were sometime equipped with attached ramrods that would be less likely to be lost. The most complex of these guns also had spring-loaded bayonets. Blunderbusses were made in all sizes, from pistols to guns intended to be mounted on walls or small boats that might have 2-inch bores and swivel mounts. Although some large blunderbusses had shoulder stocks, they could not be successfully shoulder fired without the recoil throwing the shooter off the top of the wall if the gun came loose from its mount. Even the more usual 10 and 12-gauge guns were most commonly fired from the hip and braced across the body. Some guns had tapered bores while others were were of uniform caliber, except for the enlarged muzzle. When writing a segment for my coverage of black-powder guns for the 2014 Gun Digest, “Self defense guns then and now,” a blunderbuss was a logical gun to include; but I had only a photo of an original Rigby until Sportsman’s Guide offered a .54 caliber blunderbuss kit. I purchased the gun, put it together and this gave me a blunderbuss, albeit in percussion and of smaller than usual caliber, to work with. 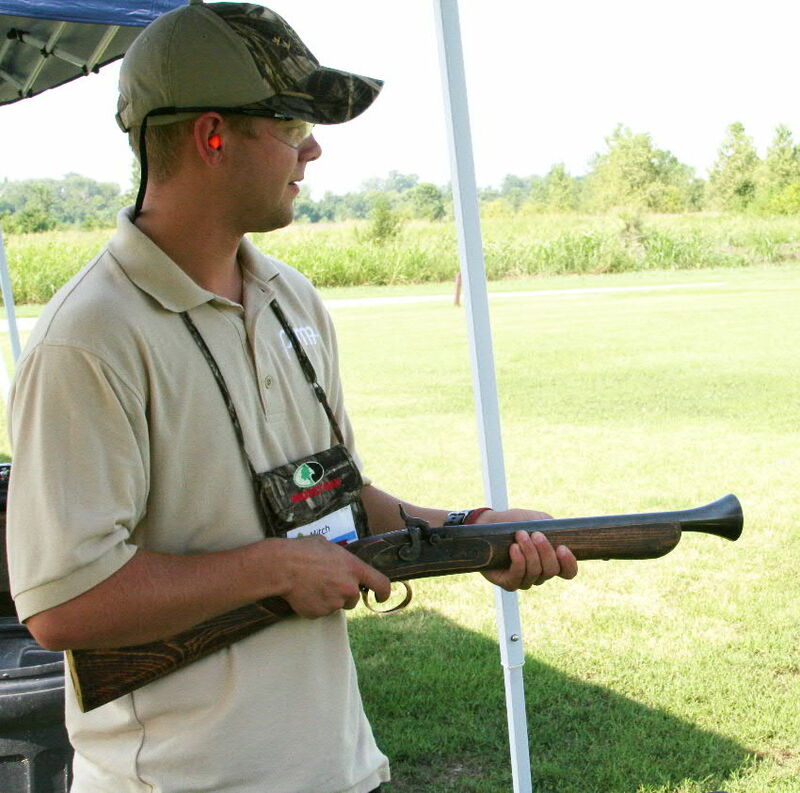 I did the Initial shooting at a POMA outdoor writers’ conference in Tunica, Mississippi. I, and everyone else, enjoyed seeing and shooting with the gun. The load I used was 70 grains of Hodgdon’s Triple Seven powder, a hand-cut thin cardboard wad, a charge of about 30-grains by volume of cream of wheat, another wad, no. 8 lead shot and 12, .177 air-rifle pellets and an over-top card wad. You can see the video at: http://youtu.be/qdjAEE4QJqA. Even though it only had a .54-caliber 16-inch barrel, it patterned the shot fairly well, but hits were about a foot high. To get the gun ready for small game I first used a load of no. 6 lead shot and then mixed no. 6 and no. 8 shot to thicken the pattern. To date I have taken five squirrels with this gun. The first one was shot from the top of a pecan tree. It ran to another tree, and I finished it off with a knife. The second, third and fifth squirrels were also from trees. Although not instantly killed by the mixed load of shot sizes, they fell from the trees and expired. The fourth was shot on the ground at about 12 yards, and killed instantaneously. In short, this gun shoots exactly like you would expect a cylinder-bored 28-gauge (actually 29-gauge) gun to shoot. 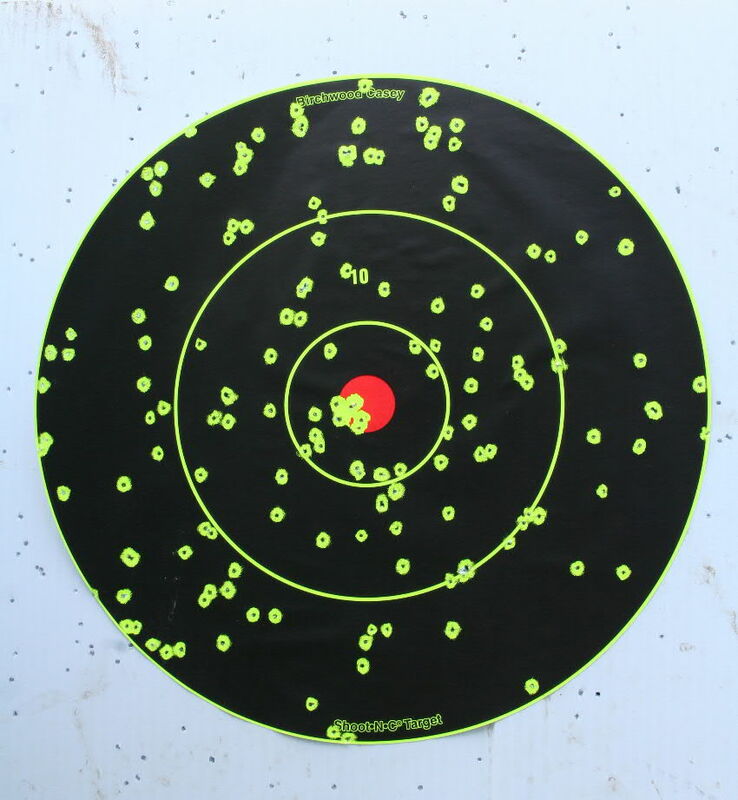 At 10-yards it gave an even pattern of shot which very quickly thins as the range increases. Because of the small bore, shot larger than about a quarter-inch, .25-caliber, will bridge across the bore, be difficult to load and not seat firmly on the powder. When I loaded the air-rifle shot these were dropped hollow base first one by one down the barrel and layered in with a cream of wheat buffer. For a non-lethal charge, dried soy beans or lentals would be about right; although these could blind and penetrate skin. As I am a hunter, my question was, “Could this gun, strange and wonderful looking as it is, actually be used to kill game.” The first obstacle was to raise the comb so that I could aim over the bell-shaped muzzle and hit closer to the point of aim. I used some cardboard to increase the height of the comb and this significantly raised the shot pattern. I felt confident enough that I could use the gun to take out three backyard squirrels and produced another video which may be seen on the wmhoveysmith Channel at: http://youtu.be/xE0088fBeQY. My conclusion is that, “Yes, a person could have used this gun to take small game; provided that he raised the comb, worked up a good load of smallish shot and could get very close to his target.” Squirrels are small targets with tough hides. Often hits were clumps of three shot that were fairly close together. No. 6s penetrated the hide, broke bones and passed deep into the squirrel’s body. No. 8s were not so effective, but would go through the hide and break small bones. No. 7 shot is not commonly seen, but would probably be the optimum size in this gun for squirrels. For doves and quail, no. 8s would be the best choice. I would always take a secondary tool, like a knife or .22 pistol, for rapidly killing wounded squirrels. Dogs are also useful, provided they are under control. Diana, even though she loves to squirrel hunt, wants to find and chase everything away long before I arrive. This is fun for her, but does not put many squirrels in the bag. She will ultimately learn, but for now I keep her on a leash and only release her after I shoot. If she gets out of the house before I do, I can fairly well give up on getting close to any squirrels. When alerted, the squirrels either freeze on the sides of limbs, run into the nearby woods or disappear into a hollow branch. A small set of binoculars is handy to confirm that what you are seeing is a squirrel on a limb and not just an odd-shaped knot on a branch. When I hunted these squirrels, the trees are still thickly covered in green leaves which makes squrrels difficult to see once they stop moving. If you are wondering what happened to the squirrels, they were eaten. I often make a squirrel stew or squirrel dumplings from them. If interested, I also have a YouTube video up on this at: http://youtu.be/nOfhw1ZqTIw. 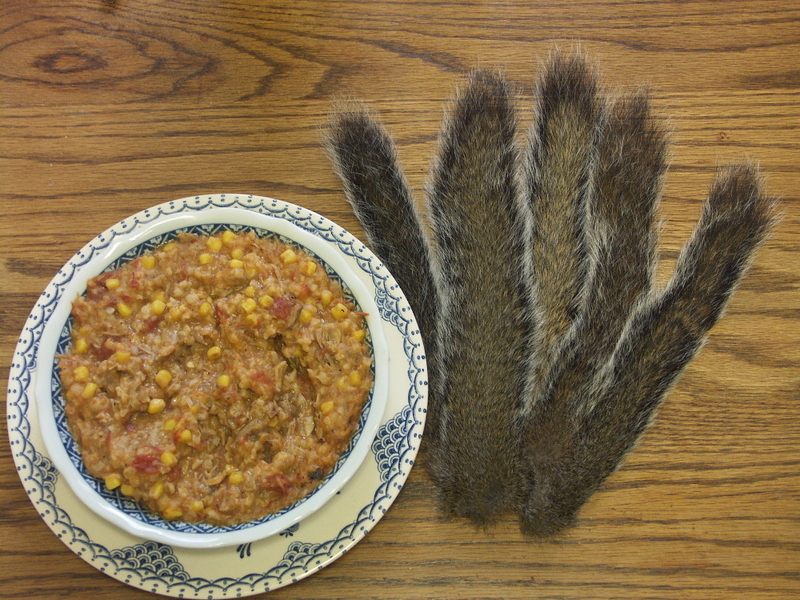 Squirrel Stew and Squirrel Dumplings are the usual result of the author’s squirrel hunts.